As the world prepares for the Paris Climate Talks, th nuclear lobby aims to get its status approved there as clean, green and the solution to climate change. In September we pointed out that new nuclear reactors do NOT solve the radioactive trash problem, despite the nuclear lobby’s pretense on this. In October we point out that the nuclear lobby is intensifying its lies about ionising radiation, with the cruel lie that it is harmless, even beneficial. The nuclear liars claim that radioactive isotopes like Cesium 137 and Strontium 90 are the same as the harmless Potassium 40 in bananas. They espouse the quack science of “radiation homesis” – i.e. 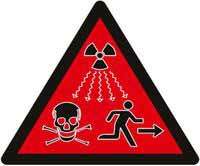 a little more ionising radiation is good for you. Ionising radiation is the most proven cause of cancer. The nuclear industry from uranium mining through nuclear power, nuclear weapons, nuclear waste, is the planet’s recent new source of ionising radiation. Even medical radiation has its cancer risk. Radioactive minerals left in the ground are a minor source. As Areva is very busy exploring and mining uranium in Mongolia, journalists and local opponents are definitely not welcomed around. A French woman named Caroline, who recently came to Mongolia together with a French man journalist, with the intention of filming a documentary, about Areva’s uranium activities in Mongolia, were guided by a few local Mongolian antinuclear activists to a certain place in Mongolia where Areva has a campsite, for uranium exploration in the aera. According to my source, they both quickly returned from that place, the French woman severely wounded by knife, both of them renouncing completely to film their documentary, and they immediately flew back to France, cutting short their stay in Mongolia. I have asked to my source to look discreetly for further details: what date did this happened, what location in Mongolia. But I told my source most of all to not take risks digging that story, to tread very lightly. Conclusion: Mongolia is a bit far and isolated, so already very little news is trickling out, but if some journalists or film makers intend to go there uninvited to make a scoop on Areva Mongol’s activities there, it may become quickly unhealthy for them! Russia and Mongolia have signed an agreement to cooperate in the production of Mongolian uranium. Prime minister Sanjaa Bayar also told journalists that his country is interested in building a nuclear power plant with Russian help. On Dec. 21, 2009, Areva announced that it has invited Mitsubishi Corporation to participate in the development of its uranium exploration assets in Mongolia with the possibility of acquiring 34% of Areva Mongol over time. Areva currently holds 36 uranium exploration licenses on more than 14,000 km2 in both the Dornogobi and Sukhbaatar provinces. According to the Nuclear Energy Authority, 107 uranium exploration licenses have been issued in Mongolia so far. Two uranium exploitation licenses have been issued as well. The agency also says the state spent MNT 16 billion for uranium exploration in 2009, MNT 25.1 billion in 2010, and MNT 37.1 billion in 2011. The Nuclear Energy Authority says it has big plans for Mongolia’s uranium mining industry. The authority says two uranium processing facilities will be built in Dornod aimag (province), and construction preparation work is already underway. The factories will export uranium products to France and Kazakhstan. April 2013 – The French nuclear giant AREVA (EPA:AREVA) revealed information about a new uranium discovery in Mongolia. AREVA Mongol, its Mongolian subsidiary, reported 50,000 tonnes of uranium in inferred resources with a grade of 0.01% as a result of ongoing exploration efforts at the Zoovch Ovoo project. The project is located in Ulaanbadrah Soum, in the southeastern Dornogobi province of Mongolia. Uranium mineralization is characterized as roll-front type and potentially amenable for the most effective lowest-cost in-situ leaching (ISL, a.k.a in-situ recovery) mining method. Thus, by the volume of uranium resources in-situ, the Zoovch Ovoo project is comparable to the biggest deposits of that type in Kazakhstan. This is not the only Mongolian exploration success for AREVA in recent years. Two years ago, the company announced the discovery of the Dulaan Uul deposit with 9,888 tonnes of uranium, following field tests which confirmed the ISL mining method as preferable. AREVA Mongol has 28 exploration licenses covering more than 14,100 square kilometres in the East Gobi province of Mongolia. This huge sedimentary basin contains promising uranium deposits well-suited to ISL mining technology. AREVA has signed an agreement to develop uranium mines in Mongolia and to create the company AREVA Mines LLC, 66% owned by AREVA and 34% owned by MON-ATOM, the Mongolian state-owned nuclear company. Areva in the text of the agreement mentioning Mitsubishi financial participation but without revealing to what extent. In 2007, AREVA purchased the East Asia Minerals Energy company, renamed it AREVA Mongol in March 2008. AREVA Mongol LLC is the parent company of the entities in Mongolia. Its headquarters are in Ulaanbaatar, the capital. All support functions are grouped together. It counts with its entities, nearly 120 employees of which over 90% are of Mongolian origin. Since 2009, AREVA Mongol owns 100% of Cogegobi. In November 2011, Mitsubishi has exercised its previous agreement of an investment option, becoming 34% shareholder in Areva Mongol LLC. The Cogegobi LLC company holds all the uranium deposit exploration permits (22 licenses). All functions related to exploration are grouped unde Cogegobi LLC. All functions relating to the operation will be consolidated within AREVA Mines LLC. Uranium in Mongolia : 1.47 millionTU estimated ! According to the 2011 Red Book, Mongolia has 74,000 tU in Reasonably Assured Resources plus Inferred Resources, to US$ 130/kg U. However, geological indications reported in the Red Book suggest that uranium resources could be 1.47 million tU. The mining sector is Mongolia’s single largest industry, accounting for 55% of industrial output and more than 40% of export earnings. Central Square of the capital city is more crowded than usual for the last ten days. United under the moto “Save the Nation”, members of three civil movements – United for Rivers and Lakes , Khuder River , and Gal Undesten – started to converge on Sukhbaatar Square since April 19th with 100 horsemen and horse carts and erected eight gers (yurts) there. Most of them are herders, who have come on horseback from countryside to demand stopping of mining activities that destroys their pastureland. All the members had their heads bound in bands and held sign boards with the slogans “We want resignation of the Government!”, “Give power to the People!”. The movement wants a national discussion on the present situation, resignation of the Government, and dissolution of Parliament. Moreover, they already have the anthem “Wake up Mongols”, which has been playing all day at the Sukhbaatar Square. Several NGOs expressed their opposition against uranium extraction in Mongolia, informed the public of the fatal effects deriving from uranium in Ulaanbadrakh soum [county], and prompted decision makers to visit the soum in Dornogovi Province to witness the conditions, at a peaceful demonstration at the Central Square [in Ulaanbaatar] on Monday (June 9). Mayak means irradiated milk, and a river 1,000 times as radioactive as normal. Genetic defects in people 25 times and cancer incidence four times the Russian average……..